Published on August 7, 2011 in Uncategorized. 0 Comments Tags: construction, magnets. 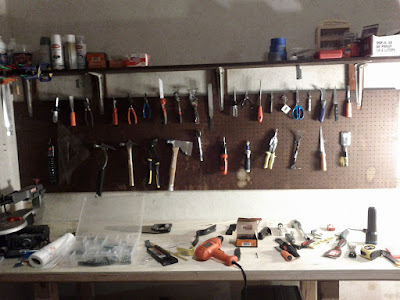 The garage had a pegboard when I moved in, but I wanted something more awesome/convenient to go with the new workbench. I just mounted all the magnets with screws to the pegboard and that was it. I did have trouble with the 5/8″ magnets, which couldn’t fit my 1″ drywall screws, so I had to dig through my random-screws bin to find suitable substitutions. Overall, real easy. It’s not clear as yet whether this is useful, but it’s awesome, and very satisfying to use. It holds about 2/3 of the tools I could plausibly hang.